Stuck in a rut? Many times we plateau at a certain weight and for everyone it is different, whether it's a squat, Olympic lifts, or the dead-lift. With micro-loading you can overcome these plateaus. Fractional weight plates help you raise the weight in increments as low 1/4 lb or .25 kg. You do not have to just add 2.5 or 5 lbs every time. Micro loading is an excellent way to push yourself, by making every set count. Lets face it, time matters and we are a now kind of world where we do not have a lot time, so we want to make sure every moment, rep, & set counts. CFF Fractional weight plates are manufactured to IWF Specifications, hold a extremely tight tolerance, and use only the highest quality materials with no impurities. We provide our customers with a set of extremely accurate, high quality plates that will last a lifetime at an affordable price. 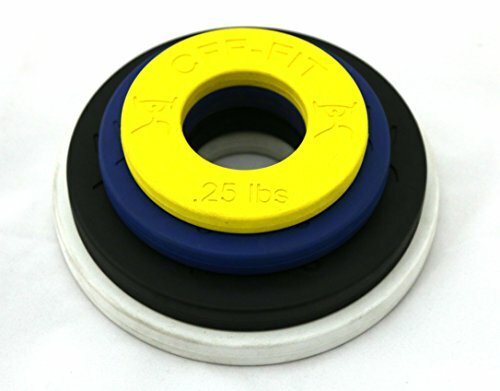 All plates are 100% virgin rubber, with the exception of the 2.5lb plate, which is 100% virgin rubber over a steel insert. Precision calibrated to less than 1 gram! If you have any questions about this product by CFF, contact us by completing and submitting the form below. If you are looking for a specif part number, please include it with your message.